Al Mashael Petroleum "Mashael" was established in 2002 as an independent petroleum trading and investment group wholly owned by Sheikh Mohamed Bin Salman Bin Abdulla Al Khalifa in the Kingdom of Bahrain. Among other things, it is licensed to trade in crude oil and petroleum products. One of our very first projects was our substantial investment and involvement in the only specialized Malaysian bitumen refinery in 2003. The refinery is already on-line and is a key supplier of bitumen in Malaysia and to the surrounding regions. This refinery has provided various job opportunities as well as playing a big role in supporting infrastructure growth, indirectly contributing to the region's economic development. In addition to the Malaysian refinery, Mashael has conceptualized the first specialized bitumen refinery in the Middle East. The refinery is located at the Port of Sohar, Sultanate of Oman. It has a target capacity to produce 1 million tons of bitumen in addition to 500 thousand tons of bi-products annually. The refinery shall be online within the next couple of years. Due to rapid economic developments in recent years, demand for bitumen in the Middle East has overtaken supply. Mashael's refinery is strategically positioned to address this supply gap and make a difference to the bitumen industry. 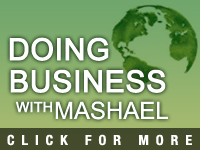 More recently, Mashael has committed itself towards environmental protection from the harmful effects of petroleum waste. This waste is collected and treated before being safely disposed. Our involvement in this area has grown substantially within a short period of time whereby our operations now cover the Middle East & other areas. We have also established a subsidiary company "MY Energy" with one of our Chinese counterparts. We have also established a trading division to supply our clients with niche petroleum products. Examples include ultra-heavy sour crude oil and specialty fuel oils. Our trading counterparts include various oil majors and national oil companies. As a result, we widened our range of collaboration with various financial institutions.